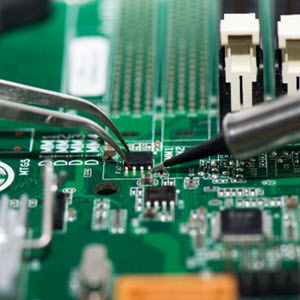 New technology and specialized medical practices have evolved over the past five decades that permit support of acute and chronic organ failure. The current era in medicine is remarkable for rapid progress in diverse fields such as cancer therapy and transplantation of bone marrow and solid organs. Consequently, patients suffering from diseases that were formerly fatal now more often than not move to "postacute" or chronic phases of illness, necessitating frequent or extended hospitalizations. A striking increase in the incidence of sepsis has accompanied medical advances. Recent studies suggest that more than 750,000 new cases of sepsis occur in the United States annually. Mortality rates attributable to sepsis range from 25 percent to 30 percent with higher mortality linked to increasing age. Preexisting or comorbid medical conditions as well as greater numbers of organs systems failed are important factors that determine outcomes. Thus, expectations are that greater than 200,000 deaths will occur annually from sepsis with annual total costs to the U.S. economy alone exceeding 16 billion dollars. Given a host of biological factors combined with aging populations and increased need for care of chronic illness, conservative projections call for a 1.5 percent increase per annum in the incidence of sepsis . Worldwide incidence figures may vary, but sepsis exacts a huge toll in lost human life and productivity. Microvascular endothelial cells (ECs) are integrally involved in regulating blood flow, coagulation, leukocyte trafficking, edema formation, and angiogen-esis. Insights into the pathogenesis of sepsis are gained by examining important concepts established through careful study of microcirculatory biology. A consensus has slowly emerged that organ failure and mortality from sepsis arise from injury and disordered circulatory homeostasis and hyperdynamic states. Hypoxemia and hypotension unresponsive to pharmacologic intervention are commonly present during sepsis. Despite the presence of enhanced oxygen delivery associated with hyperdynamic states, defects in oxygen extraction and tissue oxygen utilization produce lactic acidosis, strongly suggesting that a microcirculatory dysfunction is present. Cumulative research indicates that all anatomic compartments of the microcirculation are dysregulated. Cryer et al. demonstrated loss of vascular tone with significant dilatation of third- and fourth-order skeletal muscle arterioles (20 to 50 ||M) following onset of hyperdynamic Escherichia coli sepsis . Subsequently, workers demonstrated that resistance arteri-oles are hyporeactive to the vasoconstrictive effects of nor-epinephrine in organ-specific resistance microvasculature (e.g., liver, lung) in sepsis. Significant research indicates that the reactive nitrogen intermediate nitric oxide (NO) is a key factor producing disordered vasoregulation in sepsis. Under physiologic conditions, NO is continuously produced at low levels by endothelium and vascular smooth muscle cells through transcription of the constitutive NO synthase gene (NOSIII). However, abrupt increases of inducible NO synthase (iNOS or NOSII) expression by endothelium, vascular smooth muscle cells, and monocyte/macrophages occur following onset of sepsis, producing remarkable surges of detectable NO in the circulation. Postarteriolar microcirculatory constituents undergo significantly reduced capillary perfusion despite the hyperdynamic conditions that exist in arterioles. Studies employing intravital microscopy in animal models of sepsis not only reveal a "stopped-flow" phenomenon in capillaries but also show reduced capillary density with increased velocity of erythrocytes perfusing capillary beds that remain patent. These phenomena result in disruption of cellular oxygen delivery, thus producing the metabolic acidosis characteristically observed in sepsis. Lipopolysaccharide (LPS) glycolipid is a key outer cell wall component of Gram-negative bacteria released from the surface of replicating and dying bacteria into the circulation where it interacts with ECs on luminal microvascular surfaces. LPS is a fundamental factor inducing microvascular dysfunction and shock in sepsis. LPS bioactivity is detected in the circulation of septicemic patients. Studies show that levels of circulating LPS predict development of multiple organ failure, including acute respiratory distress syndrome (ARDS) . A substantial body of human and animal experimentation reveals that entry of LPS into the circulation produces prompt transcription of proinflammatory cytokines such as tumor necrosis factor-a (TNFa), interleukin-1 (IL-1), and interleukin-6 (IL-6). Abrupt cytokine surges in turn promote iNOS transcription by endothelium and vascular smooth muscle cells, leading to increased nitric oxide generation and loss of microvascular responsiveness to vasoconstrictors. Further, cytokine surges produced by LPS lead to acute changes in endothelial cell physiology, resulting in disruption of essential endothelial functions such as adhesion, thrombogenesis, and permeability (see later discussion). LPS binds to both circulating monocytes and tissue-bound macrophages, mediating signaling through a complex array of cell-bound receptors. These data suggest the presence of an LPS receptor-signaling complex. The b2 integrin CD11/CD18 and gly-cosylphosphatidylinositol-anchored membrane protein (CD 14) bind LPS at the cell surfaces of monocytes and macrophages. This binding event facilitates interaction with toll-like receptor 4 (TLR4) and a nonmembrane-spanning molecule designated MD-2. Emerging work suggests that LPS binding to CD11/CD18 and CD14 activates TLR4, initiating signaling events that lead to transcription factor activation and cytokine secretion. Studies using TLR4 knockout mice show the appearance of explicit LPS resistance and suggest that TLR4 mediates specificity to certain bacterial lipoproteins and other components of Grampositive bacterial cell walls . Current research indicates that cytokines secreted by LPS-activated mononuclear cells (e.g., TNFa, IL-1) are primary mediators of shock and microvascular dysfunction in sepsis. This is supported by multiple studies showing that (a) intravenous infusion of TNFa or IL-1 into the circulation promotes systemic responses identical to that observed following LPS infusion, (b) infusion of neutralizing antibodies to TNFa or chimeric inhibitors of the 55-kDa TNF receptor (TNF-R1) fused to an immunoglobulin heavy chain fragment attenuates LPS-induced shock in animal models, and (c) deletion of the TNF-R1 gene in mice produces increased survival following LPS infusion . Both in vivo and in vitro studies suggest that TNFa is a central proinflammatory cytokine mediating activation of microvascular endothelium following onset of endotoxemia in sepsis. Binding of TNFa to its transmembrane receptor ligand, TNFR-1, induces signaling events that initiate activation of nuclear factor kB (NFkB). NFkB exists in endothelial cell cytoplasm com-plexed to a family of inhibitor kB proteins (IkBa-e). Phosphorylation of IkB by the upstream kinase NFkB inducing kinase (NIK) targets IkB a for ubiquitination and protea-some degradation, thus freeing NFkB for nuclear translocation and binding to cognate sequences of key endothelial cell genes. TNFa induces coordinated activation of other important transcription factor families including activator protein-1 (AP-1), a member of the c-Jun and c-Fos family of proteins, and CREB, the cAMP-responsive element binding protein. Cooperative interactions between transcription factors such as NFkB, AP-1, and CREB lead to transcriptional activation of essential endothelial genes that induce a substantial number of pathophysiological events observed in sepsis. New information also suggests that TNFa not only produces explosive activation of NFkB-related genes but also mediates their sustained activation. Important work by Johnson and colleagues revealed that following TNFa exposure, human endothelial cells exhibit a 50 percent reduction in IkBb, the IkB isoform essential for retarding or down-regulating subsequent NFkB translocation . Johnson's work further showed that TNFa induces extended periods (i.e., 22 hours) to onset of resynthesis of IkBb, permitting protracted NFkB translocation. Thus, TNFa not only induces immediate NFkB activation in endothelial cells but also prolongs activation of proinflammatory genes mitigating and amplifying the septic process. Apoptosis is an ATP-dependent form of cell death characterized by chromatin condensation, DNA fragmentation, cell shrinkage, and "blebbing" of plasma membranes. Significant evidence from human and experimental animal studies suggests that endothelial cell apoptosis and injury are fundamental features of the microvascular response to sepsis. Mutunga et al. showed that human subjects suffering from sepsis and septic shock exhibited increased numbers of detached endothelial cells found free floating in the systemic circulation . Mutunga's study further showed that increased numbers of circulating endothelial cells correlated negatively with survival. Histological evidence of widespread microvascular EC injury is consistently observed in postmortem lung biopsies obtained from patients dying of sepsis-related acute respiratory distress syndrome. In vivo studies in mice, rats, rabbits, and baboons reveal that infusion of LPS or live Gram-negative organisms invariably leads to increased numbers of apoptotic ECs as well as pervasive EC detachment from capillary beds in lung, liver, and small bowel. Caspase activation is a hallmark of apoptosis. 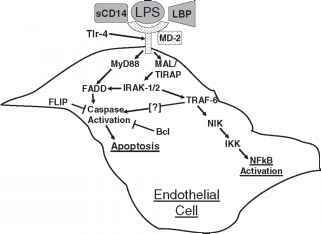 LPS and TNFa released into the circulation during sepsis activate caspases leading to key proteolytic events that produce apoptosis. Of the 14 known caspases expressed in mammalian cells, LPS and TNFa are reported to activate caspases 1, 3, 6, and 8. Controversy exists concerning the precise mechanism leading to the disseminated apoptosis observed in microvascular ECs during sepsis. In vitro, LPS induces proapoptotic signaling in ECs with resultant cell injury and death in the absence of host-derived mediators such as TNFa. A synthesis of prior publications shows that LPS binding directly activates signaling pathways that lead to both NFkB activation and apoptosis and that these pathways share certain signaling molecules including MyD88, IRAK-1, and TRAF-6 (Figure 1). Eloquent studies incorporating antibody and knockout strategies have produced an emerging discernment of the pathways that result in apoptosis following LPS binding to ECs in microvasculature. chimera comprising the extracellular domain of the TNF receptor fused to an immunoglobulin heavy chain fragment . The TNF-binding protein construct in Haimovitz-Friedman's study bound biologically active TNFa and protected C57BL/6 against LPS-induced death. The TNF-binding protein strategy blocked LPS-induced ceramide generation and resulted in striking reductions in the intensity of EC apoptosis, leading to the schema proposed in Figure 2. These and other studies suggest that systemic TNFa is a crucial mediator that is fully capable of directly producing disseminated apoptosis and injury of microvascular ECs in systemic organ beds. is rapidly reduced (to less than 30 minutes) following onset of experimental sepsis (LPS infusion) giving rise to erythrocyte rouleaux formation and the appearance of spherocytes. Blood neutrophils (PMN) promptly leave axial blood flow during this period to begin rolling adhesion along venular microvascular surfaces. PMN rolling-type adhesion is followed rapidly by firm adherence that halts PMN progress through the microvasculature. Platelet activation and aggregation occurs in virtually simultaneous time frames, exacerbating obstruction and further trapping erythrocytes. Endothelial cell engorgement and the appearance of microvascular thrombi promote further obstruction to blood flow through venules and capillaries. Remarkable migration of activated, sequestered PMN occurs across microvascular walls in sepsis. Extravasation of erythrocytes and the movement of plasma proteins follow PMN migration. Ultrastructural studies reveal that these processes lead to EC vacuolization, loss of EC lining, and ultimately exposure of basal laminar structures to the circulation . Cell adhesion molecules mediate a coordinated sequestration of PMN in the microvasculature. Endothelial glyco-protein receptors E- and P-selectins are rapidly displayed following entry of LPS and TNFa into the circulation. Rolling adhesion is mediated via selectin-to-selectin binding between endothelial-anchored selectins and the PMN affixed L-selectin receptor. A microvascular "environment for injury" is subsequently created by molecular mechanisms that tether activated PMN tightly to venular and capillary EC surfaces. Newly expressed intercellular adhesion molecule-1 (ICAM-1), a member of the immunoglobulin superfamily driven by NFkB activation, is a key participant mediating tight binding of PMN to microvascular EC sur faces. The PMN counter receptor for ICAM-1 is the b2 inte-grin, CD11/CD18. ICAM-1/CD11/CD18 binding induces flattening of PMN on EC surfaces producing an interface or microenvironment where proteolytic enzymes and reactive oxygen species produced by PMN serve as effectors inducing EC injury. Studies performed in diverse animal model systems utilizing antibody and knockout strategies reveal that disruption of both rolling and tight EC/PMN adhesion attenuates microvascular injury. Clinicians and researchers have long recognized progressive sepsis to be associated with microvascular thrombosis and the appearance of multiple organ failure . LPS, other bacterial products, and proinflammatory cytokines (TNFa IL-1) generate a procoagulant environment in microvessels. Significant research across many species shows that tissue factor (TF) expressed by activated/injured microvascular ECs and monocytes potently activates extrinsic coagulation pathways. Tissue factor binds activated factor VII forming a TF/factor VIIa complex that activates factor X. Factor X together with factor Va potently generates thrombin from its precursor molecule prothrombin. Thrombin generation markedly shifts the microvascular milieu to a coagulant environment poorly capable of fibrinolysis. Dramatic increases in plasma levels of plasminogen activator inhibitor-1 (PAI-1) and tissue factor pathway inhibitor (TFPI) suppress fibrinolysis and promote fibrin deposition. Plasma levels of major physiological anticoagulants such as antithrombin III and protein C become dramatically attenuated, further promoting a prothrombotic environment. Recent studies in humans with sepsis show that plasma PAI-1 levels herald prothrombotic states in sepsis and highly correlate with lethal outcomes . Procoagulant environments and widespread microvascular thrombosis lead to widespread thrombotic occlusion of microvasculature, producing tissue hypoperfusion, organ dysfunction, and ultimately multiple organ failure in septic patients. Evolving research reveals that thrombin generation augments injury significantly, amplifying generation of reactive oxygen species within microvascular endothelium. Further new information suggests that thrombin significantly alters microvascular EC barrier function, inducing enhanced permeability in capillary and venular endothelium by triggering rearrangement of the endothelial cytoskeletal elements. Signaling events that lead to formation of intracellular "stress fibers" are mediated through heterotrimeric G-proteins and key protein tyrosine kinases. These molecular events produce dramatic changes in endothelial cell shape, subsequently permitting leakage of plasma proteins and water into extravascular spaces . 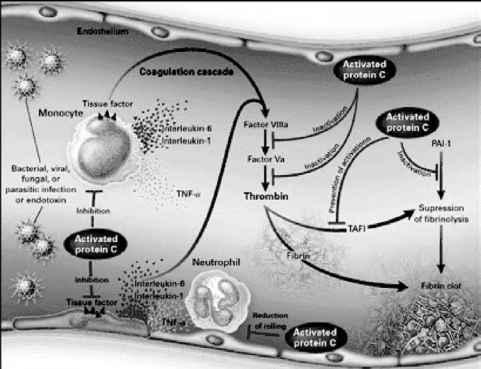 Under limited physiologic conditions activated protein C is an essential element limiting coagulation. Thrombin generation induces protein C activation by stimulating binding to both thrombomodulin and endothelial protein C receptors. Activated protein C formation is essential for swinging microvascular milieus to profibrinolytic environments. Following activation, protein C and protein S serve to minimize thrombin generation by inactivating factors Va and VIIIa. Activated protein C further promotes fibrinolysis by diminishing plasma concentrations of PAI-1 and by downregula-tion of monocyte proinflammatory cytokine (TNFa, IL-1) output . Recent exciting results were reported from a phase III trial where activated protein C (Drotrecogin Alfa) was infused into adult patients with sepsis for 96 hours. Patients who received Drotrecogin Alfa (activated) had a significantly lower 28-day mortality rates compared to patients who received placebo (25% versus 31%, p = 0.005) . Physicians have long struggled against sepsis, striving to interrupt pathological processes that produce enormous patient mortality and disability. Sepsis has claimed countless lives over the millennia. Disturbing trends that show increasing incidence bring urgency to the task of finding comprehensive therapies. 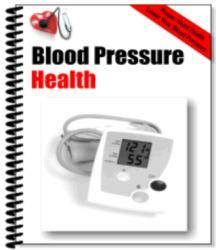 Basic and clinical research performed during the past 50 years has produced significant new knowledge. Cumulative information arising from this research has provided clearer understanding of the fundamental issues and challenges that must be addressed and overcome to institute lifesaving therapies in the future. 2. Cryer, H. M., Garrison, R. N., Kaebnick, H. W., Harris, P. D., and Flint, L. M. (1987). Skeletal microcirculatory responses to hyperdynamic Escherichia coli sepsis in unanesthetized rats. Arch. Surg. 122, 86-92. 3. Brandtzaeg, P., Kierulf, P., Gaustad, P., Skulbert, A., Bruun, J. N., Halvorsen, S., and Sorensen, E. (1989). Plasma endotoxin as a predictor of multiple organ failure and death in systemic meningococcal disease. J. Infect. Dis. 159, 195-204. 4. Poltorak, A., He, X., Smirnova, I., Liu, M., Huffel, C., Du,X., Birdwell, D., Alejos, E., Silva, M., Galanos, C., Freudenberg, M., Ricciardi-Castagnoli, P., Layton, B., and Beutler, B. (1998). Defective LPS signaling in C3H/HeJ and C57BL/10ScCr mice: Mutations in Tlr4 gene. Science 282, 2085-2088. 5. Pfeffer, K., Matsuyama, T., Kundig, T. M., Wakeham, A., Kishihara, K., Shahinian, A., Wiegmann, K., Ohashi, P. S., Kronke, M., and Mak, T. W. (1993). Mice deficient for the 55 kd tumor necrosis factor receptor are resistant to endotoxic shock, yet succumb to L. monocytogenes infection. Cell 73(3), 457-467. 6. Johnson, D. R., Douglas, I., Jahnke, A., Ghosh, S., and Pober, J. S. (1996). A sustained reduction in IkB-|3 may contribute to persistent NF-kB activation in human endothelial cells. J. Biol. Chem. 271(27), 16317-16322. 7. Mutunga, M., Fulton, B., Bullock, R., Batchelor, A., Gascoigne, A., Gillespie, J. I., and Baudouin, S. V. (2001). Circulating endothelial cells in patients with septic shock. Am. J. Respir. Crit. Care Med. 163(1), 195-200. Mutunga and colleagues obtained blood samples from (1) healthy volunteers and (2) ICU "control" patients without sepsis, (3) patients with sepsis but without shock, and (4) patients with septic shock. Endothelial cells in blood were identified by immunofluorescence, using antibodies to von Willebrand factor and the vascular endothelial growth factor receptor KDR. EC counts per milliliter of blood were significantly higher (p < 0.0001) in patients with sepsis and septic shock when compared to healthy or ICU control patients. Thus, Mutanga showed that dramatic increases in circulating ECs can be identified during sepsis and septic shock, supporting the hypothesis that endothelial damage occurs in human sepsis. 8. Haimovitz-Friedman, A., Cordon-Cardo, C., Bayoumy, S., Garzotto, M., McLoughlin, M., Gallily, R., Edwards, C., Schuchman, E., Fuks, Z., and Kolesnick, R. (1997). Lipopolysaccharide induces disseminated endothelial apoptosis requiring ceramide generation. J. Exp. Med. 186, 1831-1841. 9. McCuskey, R. S., Urbaschek, R., and Urbaschek, B. (1996). The microcirculation during endotoxemia. Cardiovasc. Res. 32, 752-763. 10. Fourrier, F., Chopin, C., Goudemand, J., Hendrycx, S., Caron, C., Rime, A., Marey, A., and Lestavel, P. (1992). Septic shock, multiple organ failure, and disseminated intravascular coagulation. Compared patterns of antithrombin III, protein C, and protein S deficiencies. Chest 101(3), 816-823. 11. Mesters, R. M., Florke, N., Ostermann, H., and Kienast, J. (1996). Increase of plasminogen activator inhibitor levels predicts outcome of leukocytopenic patients with sepsis. Thromb. Haemost. 75(6), 902-907. Mesters and colleagues studied patients at high risk for development of sepsis and measured, at onset of fever, plasminogen activator inhibitor activity and PAI-1 antigen levels. They showed that levels increased significantly normal baseline and were significantly higher in patients developing septic shock compared to those with severe sepsis alone. Increase in PAI activity and antigen in patients with septic shock was accompanied by increase in tissue-type plas-minogen activator antigen and total fibrin(ogen) degradation products. In patients who developed severe sepsis without shock, the variables of the fibrinolytic system remained unchanged after onset of fever. Differences observed between septic shock and severe sepsis were sustained throughout the septic episode for all variables. These findings suggest that septic shock in leukocytopenic patients is associated with significant activation of the fibrinolytic system arising from vascular endothelium responses to inflammatory injury. Finally, PAI activity measurements are sensitive markers of unfavorable outcomes in patients with sepsis. 12. Bogatcheva, N. V., Garcia, J. G., and Verin, A. D. (2002). Molecular mechanisms of thrombin-induced endothelial cell permeability. Biochemistry (Moscow) 67(1), 75-84. 13. Esmon, C. T., Ding, W., Yasuhiro, K., Gu, J. M., Ferrell, G., Regan, L. M., Stearns-Kurosawa, D. J., Kurosawa, S., Mather, T., Laszik, Z., and Esmon, N. L. (1997). The protein C pathway: New insights. Thromb. Haemost. 78(1), 70-74. 14. Bernard, G. R., Vincent, J. L., Laterre, P. F., LaRosa, S. P., Dhainaut, J. F., Lopez-Rodriguez, A., Steingrub, J. S., Garber, G. E., Helterbrand, J. D., Ely, E. W., and Fisher, C. J., Jr. (2001). Recombinant human Protein C Worldwide Evaluation in Severe Sepsis (PROWESS) study group. Efficacy and safety of recombinant human activated protein C for severe sepsis. N. Engl. J. Med. 8;344(10), 699-709. Dr. Fowler is the William Taliaferro Thompson Professor of Medicine and Chairman of the Division of Pulmonary and Critical Care Medicine at Virginia Commonwealth University School of Medicine in Richmond, Virginia. Dr. Fowler's research and laboratory effort over the past two decades has focused on mechanisms of vascular inflammatory injury occurring following onset of sepsis and following reperfusion of ischemic vascular beds. A major area of focus has been the regulation of interleukin-8 expression by nitric oxide in microvascular endothelium.